This old map of Liverpool is the north half of a detailed Plan of Liverpool from 1890. It’s incredibly detailed, showing every road name, paths within the parks, and even individual buildings in some streets (where those buildings were big enough). There’s also an index of street names down two sides, making it easy to look up a place of interest. 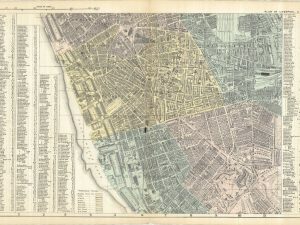 This old map is perfect for researching your Liverpool ancestors, because the index of street names helps you find where they lived. In addition, the map names dozens of businesses. If your Liverpool ancestors ran a pub, for example, it might be marked on here. Similarly, the map names churches. If you ever wondered whether St Margaret’s Church on West Derby Road looked like in 1890, its outline is on this map. Even Independent Chapels are here. The parks, like Stanley Park and parts of Newsham Park, show footpaths, park buildings and individual ponds. You’ll see these ‘green lungs’ in great detail, and find out how close your Liverpool ancestors lived to fresh air. As well as an index to streets down either side, there are concentric circles showing distances from the Town Hall, each one quarter of a mile apart. The version available here is an adapted version of the original, with the parliamentary wards colour-coded. 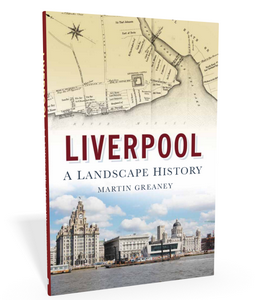 As far as Liverpool’s historic townships are concerned, this old map covers Everton, Kirkdale, West Derby, and slices of Bootle and Walton. 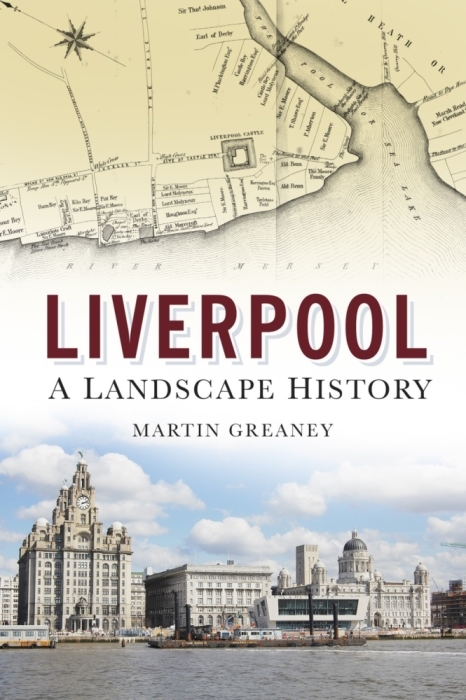 Note: Some of you will be looking for more of an old map of Liverpool which gives an overview of Victorian Liverpool, or will be more interested in the railways. 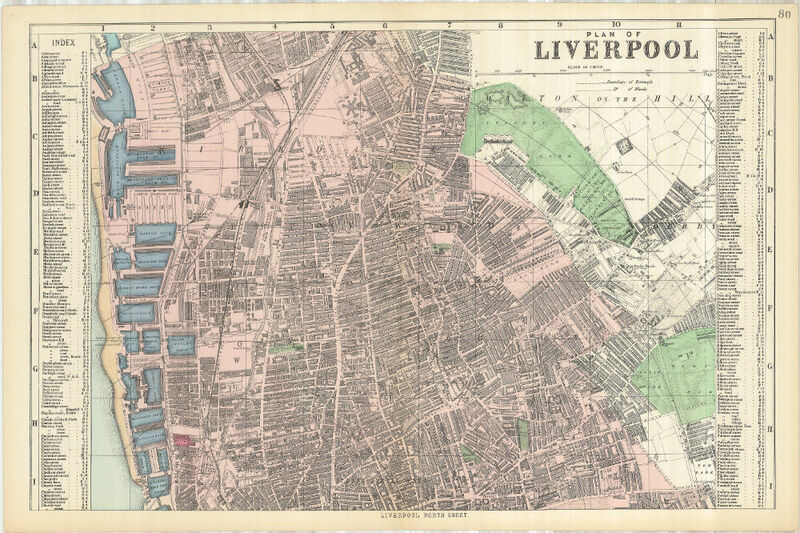 You should have a look at Bacon’s Map of Liverpool (1885), which is also available as a print. This is a beautiful piece of art in its own right. The size of the print makes it a wonderful object to hang in your home, and the high quality of the paper makes it perfect for framing. 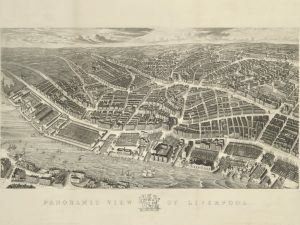 This item, and other old maps of Liverpool just like it, are available to preview as high resolution interactive maps on the website Historic Liverpool. Note that the images on this page don’t give a great impression of just how good this map is. The old map you’ll receive is a high definition print of a large digital scan. The print comes slightly larger than the original. These scans are so good so that no detail is lost in the enlargement! 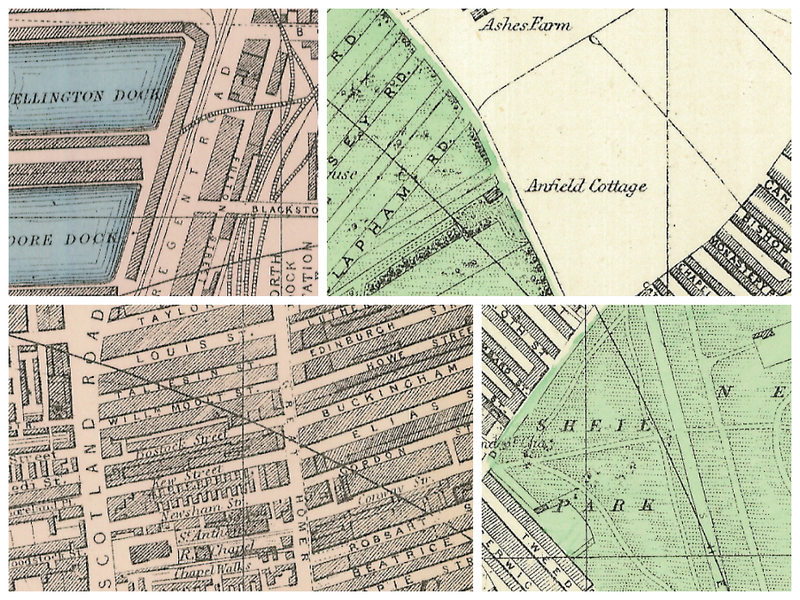 High resolution mapping – hugely detailed! This is perfect as a gift for a loved one, or to treat yourself to something for hanging in the study. It’s a fascinating piece of history you’ll want to study again and again! 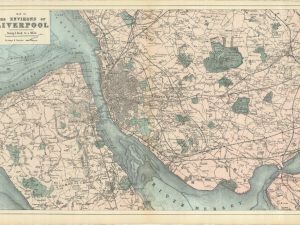 Hi, I am looking to find the house where I live on your plan of Liverpool old map, and I am not sure if it will be in the north or south plan. I live at L6 2JG near everton water tower and everton park. 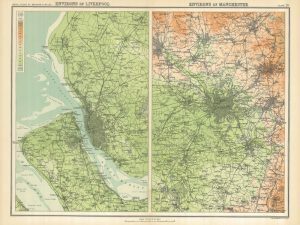 I don’t know if you found the road, but that postcode can be found here on my North Sheet: https://historic-liverpool.co.uk/old-maps-of-liverpool/plan-of-liverpool-north-sheet-1890/#5/50.875/-2.681. The road layout has changed a lot but that’s the general location.